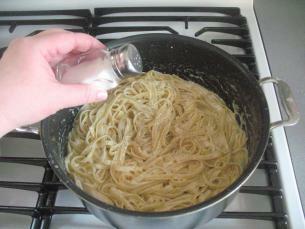 Once you try this recipe, you will never buy pre-made Alfredo sauce again! It is totally decadent and off the charts delicious – full of so much flavor and richness that you totally need to spend extra time on the treadmill after eating this Fettuccine Alfredo! 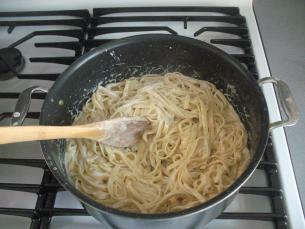 To make Fettuccine Alfredo, you will first have to know how to cook the pasta. For a quick review, check out my “How to Cook Pasta” video. Follow the directions on the back of the package of pasta that you bought and be sure to add plenty of salt to the cooking water. 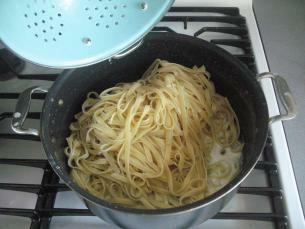 When the pasta is cooked, pour it into a colander and let the water drain off. 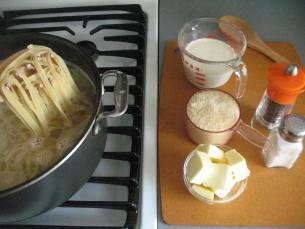 While the pasta is draining, over low heat, melt the butter in the same pot you cooked the pasta in. 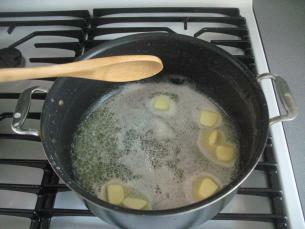 Return the drained pasta to the pot with the melted butter. 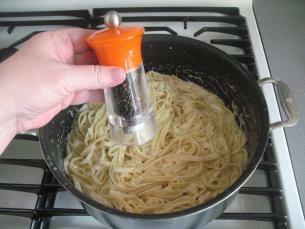 …and the grated parmesan cheese. 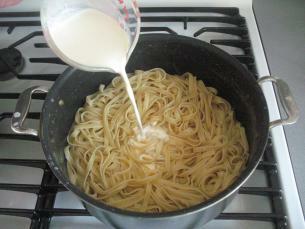 Toss everything together over low heat until the pasta is coated with the cream, butter and the cheese. 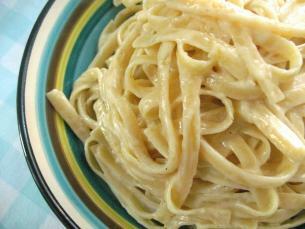 Give the Fettuccine Alfredo a taste to see if it needs salt. 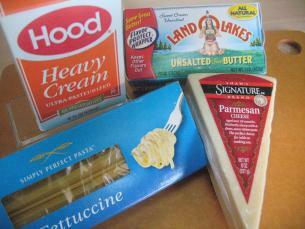 Some brands of Parmesan cheese are saltier than others, so give it a taste before automatically adding in the salt. That’s it! Time to enjoy! I love fettucini this way and I’ve made it a few times in the past, each time coming away disappointed. It always ended up with a grainy quality that just didn’t feel right, as if I’d used that parmesan-flavored sand you get in a can from Kraft. It’s been a while, but I’m sure the recipe I used was similar if not identical to this one. Any idea what may be happening? 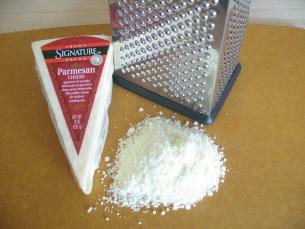 I grated my parmesan cheese into almost a fine powder and the result was not grainy. If you are using a box grater be careful of your knuckles! This can be a bit of a workout grating the cheese this fine! 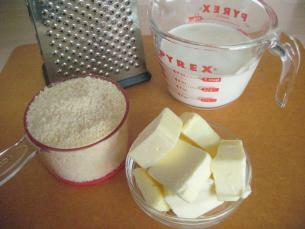 In my Cheese Graters post there are four photos showing how fine the four sides of a box grater will grate cheese. Once made, this Fettuccini Alfredo should get eaten immediately. Leftovers in the fridge turn to a solid mass that you can slice with a knife! When I see my body getting fatter and fatter everyday, I realize that I should cook meals without using any fat or cream. I wish that we could find some low cal recipes at startcooking.com. A different grater may be in order. Back when I was doing this, I was using a rotary grater similar to this one, but it was just a cheapie and it may not have worked as well as one might hope. KGW I love those little graters! Growing up I remember my mom using one all the time! We do need to think more about getting fit. We did a survey to discover what fans of startcooking want to learn how to cook. Fettuccini Alfredo, Chocolate Cheese Cake, and Healthy Foods were the top three on the list! Go figure. We do have almost two dozen salad listings as well as numerous vegetable and soup recipes. There are in fact many recipes that do not call for heavy cream! Kathy I like salads and soups but my idea was to cook everything with lowest possible fat. Is it possible to prepare Fettucine with no fat? Use milk or light white cheese and a touch of Parmesan. I do not believe that sugar or carbohydrate makes you fat; but they dissolve easily inside fat creating an emulsion that stays in the body as fat. I have yet to experiment with a low-fat/non-fat version of Fettuccini Alfredo. I just discovered that if you Google low fat Fettuccini Alfredo there are thousands of recipes to choose from. Hopefully you will find one to suit your nutritional needs. Good Luck and be sure to let us know what you discover! I have a low fat mental block, I can be eating somthing totally delicious and as soon as I am told or realize it is low fat, my taste bud alarm goes off. I am sur eI am not alone, but I am also convinced it is a much mental as it is phyical. Hi David, my mom was exactly the same! As far as she was concerned, make it real or not at all. Good Luck Cristina! You really can’t go wrong with this recipe, but remember you have to serve it immediately after making it! By the way, could you make a blog about the best way to prepare homemade fried potatoes? Hi Rene, it sounds like you are really into fried potatoes! I like oven roasted fries. In fact I think that’s where your comment should be posted! I love cooking good food anyways. So, just one enhancement to this dish – I made it before and it works well with “pre-grated” parmesan and will not come too grainy if your pasta is very hot like just before the mixing.. or giving a very low heat during mix will help smoothen the fettucs..
As for the enhancement, I like having diced cubes of any kind or bacon or ham (these can be pre-pan fried to give a little crisp feeling). it really will give a little meat into your meal. Diced ham or crumbled bacon is a perfect addition to this recipe! Do I need to add pepper to it? Do most grocery stores have heavy cream? Does the pamesan cheese have to be freshly grated? Shakila, you can skip the black pepper if you wish. Yes, grocery stores do sell heavy cream, and yes you should use freshly grated Parmesan cheese for this recipe. This really is off-the-charts delicious! I added some smoked bacon to mine. Hi Kathy, this is a very nice recipe. Have you tried adding corn kernels to this recipe? Might be a good idea to remind the people that every time you plan to cook the pasta for 1-2 min in the souse as well, like in this recipe … and when the pasta is draining for 1 min or so waiting to be added to the souse … this times are “pasta cooking times” that have to be subtracted from the time the pasta cooks in water. If this gets neglected you get somewhat overcooked pasta. Thanks Bogdan for your great hints! My favorite pasta dish!. I’ll have to try this recipe. 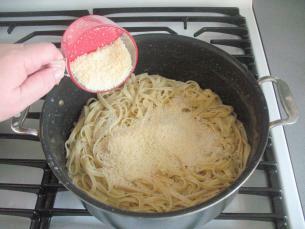 If you can find shaved parmesan rather than grated, it will melt a bit more in the hot pasta. That can help with the “grainy” problem. I tried this and it came out perfect! My husband and I loved it and were thankful it was so easy to make. Unfortunately, we found out 3 days later that he has Celiac and is unable to eat gluten. So now he is crushed that he cant have this dish. I found gluten-free fetteccini noodles. Do you think it would be ok if I followed the same recipe and just replaced the noodles with the special kind? You can certainly substitute any pasta you want. 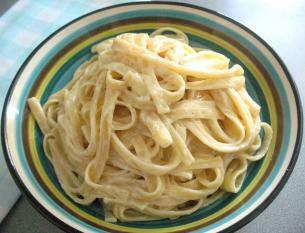 “Fettucine” is just the name of the pasta that’s traditionally used, and what makes it “Alfredo” is the sauce. In fact there are a number of dishes that add that adjective to their name because they use that sauce. Potatoes Alfredo, Chicken Alfredo… whatever would be good with a creamy Parmesan sauce is fair game. Thanks KGW for the great advice!